By Mary Gallagher. Photos by Will Davis. Are you traveling I-95 New York to Florida at least once a year? Well North Carolina is proud to offer the Roanoke Rapids Theater providing a great evenings entertainment break! 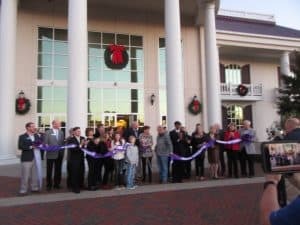 Ribbon cutting at the versatile entertainment complex the Roanoke Rapids Theater. Built ten years ago in a partnership between the city of Roanoke Rapids and Randy Parton (Dolly’s brother) this magnificent structure, in the manner of Branson and Tennessee performance theaters, is back on track. New owners Tom and Evon McLean of Greenville, NC celebrated their grand opening Saturday, November 10th with a sold out enthusiastic crowd of 1700 fans ready to rock with the hit producing legendary Charlie Daniels Band. “The Grand Opening was fantastic. It was the largest crowd that this theater has ever seen. 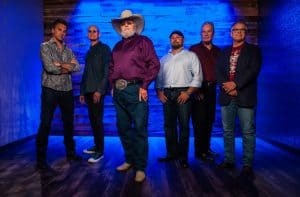 But I’m not surprised, Charlie Daniels is one of those guys that everyone wants to say they have seen. This is just the beginning, though. There will be many more seat-filling acts on that stage and entertaining events at this theater.” said the theaters new owner Tom McLean. The band started on time and performed for 90 minutes. Sets featured members of the band, instrumentals with everyone participating and Charlie doing many of his famous hits while giving little history comments along the way. Born in North Carolina, at one point he said “I’m 82 and still rocking on!” to applause and cheers from the crowd. Popular local artist Michael Telliga did an enjoyable 40 minute warm up and played to an enthusiast dancing crowd in the large two story domed lobby after the main event. The theater is a multi-purpose entertainment and dining destination with easy access at I-95 Exit 171. We enjoyed the spacious comfortable seats with lots of legroom, wide aisles, the beautiful lobby and large flat parking lots. Roanoke Rapids is a popular stopping point for travelers and features a wide range of hotels and motels in every price range. Local and chain restaurants, and a large Walmart all are located within half a mile of the main exit. Taking in a night at the Roanoke Rapids Theater is an easy option and welcome break for road bored travelers. Much more than a live entertainment venue, the Theater is being re-imagined as an asset to be enjoyed by all residents of the Halifax County region, as well as travelers and visitors along the entire eastern seaboard, for many years to come. Doors are open 7 days a week, offering food, drinks and entertainment even when no shows are scheduled on the main stage. Check the website and Facebook page to see what is scheduled when you’re passing by.